How Does Texas stack up in the Case-Shiller report? As before, I have not tried to duplicate S&P’s methodology. 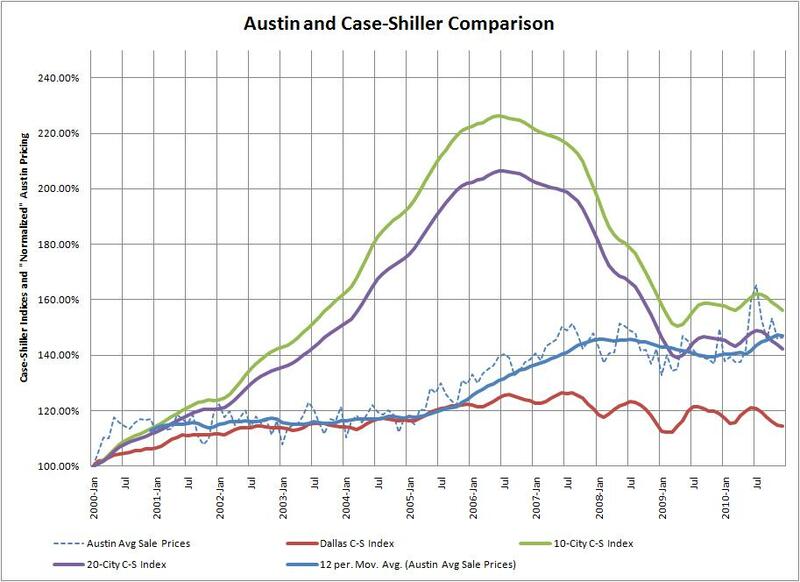 Instead, I have simply “zero’d” a graph of Austin Average Sale Prices at January 2000, and added a 12-month moving average for comparison to the indices shown. Most discussion of the housing downturn focuses on how much value has been lost in real estate in recent years. That, combined with some very “creative” mortgage financing that facilitated — maybe even caused — the housing bubble, is important, especially for those in California, Arizona, Nevada, and Florida who purchased homes near the market peak. That perspective, however, ignores how much value was created during the boom: On average, if you bought real estate in 2004 and experienced the same appreciation as the 10-City Composite Index, you gained about 37.5% in value by January 2006. If you made a 20% down payment to make that purchase then your leveraged return was actually 187.5%. How many investments can offer the potential to almost triple your money in two years? Yes, for all the financial devastation during the recession, there were huge fortunes made during those years in the cities that are now suffering the most, but on average homeowners who purchased in those cities before 2004 and are still holding their properties are still fine. If they bought in 2000, they have still gained substantially more in market appreciation than Dallas or Austin. Note that the Dallas market has been pretty tame throughout the cycle. Dallas property owners did not see the incredible run-up, so the downturn wasn’t nearly so painful. That is even more true in Austin, where our 12-month average sale price reached an all-time high in December 2010. Is there uncertainty still ahead? Absolutely (see my Austin Market Dashboard), but virtually all indicators call for continued improvement in the Austin market. It won’t be a straight line, but I agree with the forecasts, and I believe we will see real, predictable growth by 2012.